It’s About What It Really Costs You! Waste is defined as anything other than the MINIMUM amount of time, equipment, tools, material, parts, people, and space required to ADD VALUE to the product. Inventory waste in the Finishing Industry would most likely be related to raw materials, WIP (work in progress) or finished goods stock that is held, not having value added to it. Equipment, tools, people and space would also come in to play. Inventory waste is stock and work in process in excess of the required amount needed to produce goods “just in time”. Unnecessary inventory that accumulates before and after processes is an indication that continuous flow is not being achieved. Large batch sizes, lack of balance in work flow, long changeover time, incapable processes and not adhering to procedures may all cause excess inventory in your finishing process. Every piece of inventory you hold has a physical cost associated with it. There are also less obvious costs that cut directly into your profit including the transportation and movement of this inventory, the space required to store it, the administration keeping track of it, the cost of writing it off if it becomes obsolete, and even the cost of insuring it. An IntelliFinishing (alternative to power and free) automated finishing system for powder coating or liquid coating is very responsive to Lean manufacturing, and focuses on optimizing product flow throughout the finishing process while adding value to your products and to your productivity measurements. With a turnkey finishing system provided by IntelliFinishing, batching product is no longer necessary. The IntelliFinishing system has immediate response when adjusting to process changes and production flow providing continuous improvement in your finishing processes. It can even be extended to point of use, allowing your parts to travel from paint to assembly to shipping, improving your workflow. Our lean system allows for pre-programmed recipes that automatically change process speeds and dwell times specific to the part and part family. Buffering is the ability to collect products that can be delivered at a different rate than received. Many times, power and free conveyor systems are designed with buffer zones. IntelliFinishing has the ability to move parts off of the line for additional masking, while allowing faster processed parts to continue through the system. While buffering space is available with an IntelliFinishing completely automated system, it is usually not necessary. Routing can be optimized based on system availability. IntelliFinishing’s smart controls allow you to input recipes with the unique application requirements for each part family. As different parts are loaded onto the system each recipe dictates process changes throughout the system on the fly, improving not only your efficiency, but also the quality of your parts. IntelliFinishing’s unique chainless conveyor completely eliminates the chance for lubricant from a chain to drip onto parts. Also, part recipes and the ability to move in forward and reverse decreases the chance of parts being over-cured or under-cured. With the addition of smart controls to your paint line, IntelliFinishing gives you the capability to review your production data to determine the root cause of a bottleneck and take action immediately. You have the ability to “catch up” with an IntelliFinishing system because you can speed up on demand, whereas monorails are limited to one speed only and power and free requires a separate chain to run delivery speeds. IntelliFinishing allows for spurs to easily be incorporated into the design of your system with the forward and reverse direction of travel inherent with the conveyance technology. Spurs can be used as cooling areas, maintenance areas, inspection areas, or to re-sequence parts on the line. Spurs are easily incorporated into the design of an IntelliFinishing complete paint system. The forward and reverse direction of travel that is inherent with the conveyance technology is perfect for cooling, maintenance or inspection areas, or to resequence parts on the line. Visit our website at www.intellifinishing.com and compare the IntelliFinishing options to monorail or power and free traditional systems. 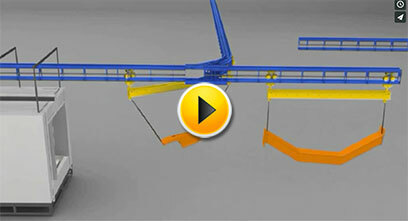 See the differences, and learn how to choose the right conveyor for your production needs. There is always much more involved than just the price of a new system. Why not have a system that gives you some of that cost back in savings?